I’m on a pine nut kick lately. Ever since I had them in my Spring Meatballs. It’s more because I bought a bag and a little goes a long way. I’ve been adding them to things like soups and salads. I used them also in this salad for a nice crunch and a little bit of healthy nut fats. I still have more left in the bag so I need to find yet another way to use them. Preheat your grill to medium heat and salt and pepper the pork chops, if desired. While the grill is heating, drain and rinse the garbanzo beans and set aside. Microwave the green beans according to package directions. Mine took about 4 minutes. While the beans are cooking, place the pork chops on the grill. Cut the roma tomatoes into chunks and place in a large bowl. Chop and add the cilantro to the bowl along with the garlic, lemon juice, and mustard. Check on the pork chops and flip them to the other side. Add the garbanzo beans and pine nuts to the bowl with the veggies and toss to combine. Once the pork chops are cooked thoroughly, remove from the grill. 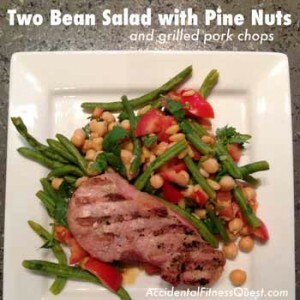 Divide the bean salad evenly on plates and serve with the pork chops. Makes 4 servings at approximately 319 calories – 31g protein, 26g carbs, and 9g fat.